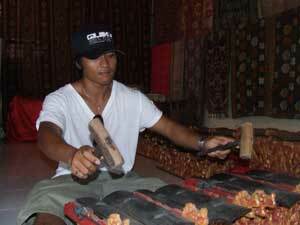 Denis is currently based in Kuta and is available as a cultural guide for visitors to Bali - to have a chance to see traditional village life and be introduced to traditional Balinese culture, gamelan groups and teachers. Bandung's exciting gamelan fusion band will be touring Adelaide and Melbourne during April 2010. If you would like to complete the survey, please fill in the Form. Ignore the section at the bottom if you do not wish to become a member. Access to members only AIAA yahoogroup which has the most up-to-date info on Indonesian culture and events in Australia. Support for Indonesian cultural exchange projects through contact with Australian and Indonesian individuals and organisations committed to cultural exchange. Go to Join AIAA in the table of contents above left. Thank you to all contributors. Terima Kasih Banyak! Copyright © All information, pictures and sound on this page and the following pages are copyright and can only be reproduced for study purposes or sharing of information. Disclaimer: The articles contained in this magazine are gathered from a wide range of sources and do not necessarily reflect the views of AIAA members.